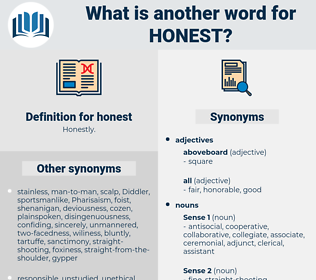 What is another word for honest? sincere, decent, honourable, conscientious, honoured, respectable, virtuous, open, wholehearted, righteous, authentic, good-faith, disingenuous, dignified, reliable, Bona, even-handed, legitimate, hearty, innocent, upfront, proper. truthful, straightforward, candid, forthright, genuine, frank, earnest, heartfelt, trustworthy, upstanding, honorable, corruption-free, true, upright, outspoken, faithful, impartial, reputable, transparent, clean, loyal, equitable, serious, frankness, reasonable, up-front, fair-minded, correct, blunt, realistic, unfair. lying, misleading, deceitful, untruthful, untrustworthy, irresponsible, devious, fraudulent, corrupt, counterfeit, insincere, partial, prejudiced, false, unreasonable, unsuitable, biased, deceptive. polished, arch, incorrect, errant, unauthentic, imitation, cultivated, traitorous, improper, evasive, civil, inhibited, treacherous, unseemly, manipulative, worldly, suspicious, untrue, cutthroat, supposititious, unbecoming, sophisticated, assuming, considerate, smooth, evil-minded, unscrupulous, offensive, manufactured, unreal, unconscionable, perfidious, cosmopolitan, blamable, atrocious, inequitable, close-mouthed, unfair, refined, laconic, intriguing, censurable, critical, politic, unbelievable, diplomatic, unreliable, synthetic, culpable, dissembling, untrusty, fibbing, profligate, ambiguous, dissimulating, undependable, sycophantic, Equivocating, quiet, worldly-wise, taciturn, knowing, unfaithful, unworthy, hypocritical, reserved, indecorous, immoral, civilized, blameworthy, equivocal, faithless, erring, cultured, objectionable, wary, mistrustful, cynical, canny, disingenuous, polite, reprehensible, man-made, tactful, naughty, pretending, guileful, mean, imitative, unprincipled, suppositious, flattering, fallen, fabricated, courteous, adroit, tight-lipped, unjust, restrained, calculating, knavish, indecent, criminal, skeptical, posing. My dear, honest children, said she, I am very glad you told me all this. You shall not lose me, Euphra, if you will be honest to yourself and to me.